← To Dean’s Again – and the Last Adventure Aboard Ol’ Rex. The Salmon are Running the Sacramento River! 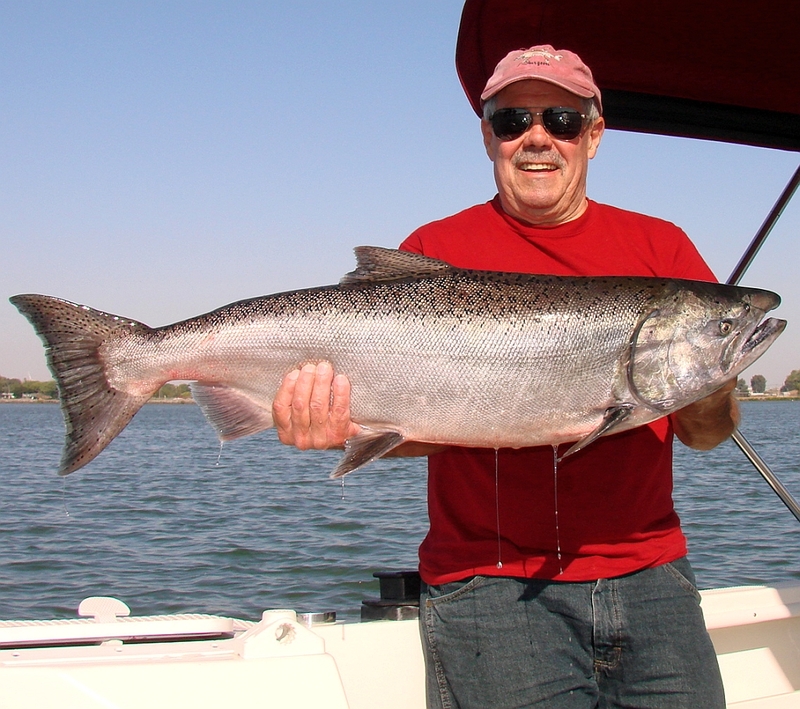 Three Days on the Sacramento Delta and Two Gorgeous Salmon! The salmon are running up the Sacramento River! This is the time of year for old geezers to struggle out of the rocking chair and go fishing – and that includes ol’ FishWisher. To get my share of the fun, I loaded up the new (to us) motor home, stowed gear aboard the boat, and headed for Brannan Island Park for a few days. I launched the boat at one of the ten lanes at Brannan’s beautiful ramps, chained the trailer in the parking lot, parked the coach in the RV park, and settled in for three days of fishing. FishWisher docked at the Brannan Island State Park berth between salmon chases. Day one began with a cruise upriver to the Rio Vista Bridge where I began my troll. I dropped a green and chrome FlatFish into the river on the port side, and a red Silvertron on the other. I continued on up the Old Sac, past the fleet of others fishing for salmon at the mouth, past Vieira’s Resort, and along Long Island where many lovely waterfront homes line the river. As I approached the upriver end of Long Island, something slammed the FlatFish, and my reel screamed out the good news! I turned the boat into the middle of the river, put the little trolling motor into neutral and joined the fight. The big fish didn’t fight for long, but for a few minutes I enjoyed a fight with a strong, angry salmon. In too little time I had the big girl in the net, and administered a couple of righteous whacks. I brought her aboard and weighed her in at 15 Lbs. My first salmon of the season was in the box! And then the search for the limit fish was underway. I cruised on up past the Isleton Bridge a half mile or so, then turned back down river. As I trolled I called my nephew, Darren, who told me he’d love to have a salmon. He agreed to meet me at Vieira’s to pick it up. I trolled the area near Vieira’s as Darren drove over from Stockton, but I couldn’t stir up any more action. 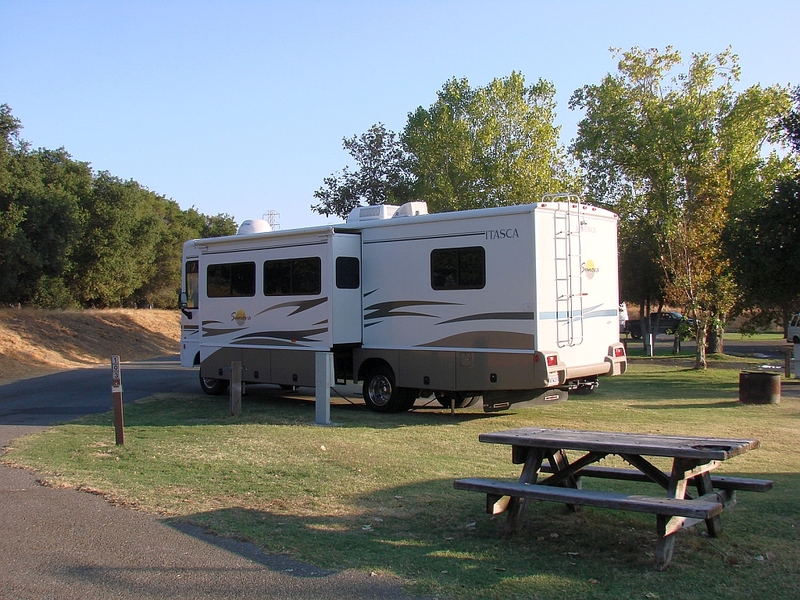 The new coach parked in a RV space at Brannan Island State Park. The state of Kalifornistan has allowed the park to deteriorate badly due to lack of maintenance and typical Kalifornistan management of state assets. Recently the state contracted to a private concern the management of the park. I hope that helps, but I have my doubts. This was my last stay at Brannan aboard the coach as the place is so poorly maintained. For launching only, you can’t beat the park anywhere in the area. They have a nearly new, 10 lane launch ramp that is superb. For now. After Darren took the salmon off my hands, I headed back to Brannan for the night. It had been a short day of fishing, but I had landed my first salmon of 2012. At the Brannan Island berth I unloaded the valuables from the boat, and headed for the coach. It was a pleasant and very restful evening aboard the new coach, and I looked forward to fishing the next day with my ol’ buddy John. I was up and stirring before 0500, doing morning chores and looking forward to meeting John at Delta Marina where we’d drive into town for breakfast. After a choppy cruise upriver to the marina, I docked the boat and we headed to The Striper cafe in downtown Rio Vista. After a good, hometown breakfast of eggs and pancakes, we drove back to the marina and boarded the boat. At 0845 we were trolling upriver at the Rio Vista Bridge. We spent the morning chugging upriver pulling a FlatFish and a Silvertron lure. We cruised about a mile or so beyond the Isleton Bridge, then turned back downriver, trolling nearly to the mouth of the Old Sac. We heard reports of salmon being boated near the ferry that crosses the shipping channel just above the mouth of the Old Sac and Steamboat Slough. We decided to give that area a try, and trolled in wide ovals, hoping for a salmon strike that never happened. After a couple of hours we trolled on downriver to the Rio Vista Bridge, where we had begun our day’s troll. As we passed under the bridge it was nearing 1730, and it was time to give up for the day. We cruised on down river to the marina to drop off John for his drive home. It had been a long and beautiful day trying together for some salmon action, but it just wasn’t meant to be. A few boats had multiple fish in the box for their efforts, but I think most folks were also skunked. After dropping John off at the marina, I cruised downriver to Brannan Island for the night. I was happy to step up into the cozy coach to spend a comfy evening at “home”. After a hot shower and a couple Tom Collins cocktails, I was looking forward to one more day of trying for those elusive salmon. Thursday, Day 3: Last full day at Brannan Park. I was up early again, as usual. While I waited for day break, I busied myself with the usual chores, and found myself delayed as I tried to improve the water pressure in the new coach. Then after a hearty homemade breakfast of oatmeal, I finally toted the gear down to the boat and began my last day of salmon fishing for this trip. At 0845 I began trolling at the Rio Vista Bridge. Less than an hour later, and maybe a quarter mile above the bridge, something wild and crazy suddenly grabbed my green, double bladed Silvertron lure and began ripping line off of the starboard reel like nothing I have ever experienced before! That critter peeled line ‘til I was seriously wondering if he would spool me. Finally, maybe 70 or more yards from the boat I saw him breech as he continued his manic run for freedom. The crazy, truly wild salmon that at first I thought might be a Russian submarine! I’ve never had a fish run like this nut job, but it was one very exciting fight while it lasted! He soon tired after his wild run, and I was able to work him to the boat much sooner than I expected. After just seven or eight minutes, I had him beside the boat. Although he tried to go deep, he didn’t have enough strength to pull line. I scooped him into the net and welcomed him aboard. He weighed in at 21 pounds and measured 36 inches. As salmon go, he wasn’t all that big, but I’d never seen any fish go so ballistic for so long. He was the most powerful fish for his size that I’ve ever tangled with, and his wild abandon to get free was downright breathtaking. I continued trolling, turning up the Old Sac River and beyond Long Island. I then turned around and trolled downriver ‘til 1430 when I reeled in and fired up the main engine for a cruise to The Point Restaurant where I had agreed earlier to meet one of my River-Rat fishing buddies. Ol’ “SeaRay Bill” is well known around the salmon grounds for his consistent efforts to catch salmon, and for his great success rate. He’s a very knowledgeable fisherman, and this day he would be a great source of information about that crazy salmon I had in the fish box. Bill speculated that I may have hooked into one of the relatively few “wild salmon” – one that hatched naturally and made its own way through the river system to the ocean. Most salmon making their return to spawn have been hatched in state facilities such as the Nimbas Hatchery, then released way downriver, somewhere around Sherman Island. They have a much greater chance of successfully making it through their life cycle with such help. Bill said about 90% of salmon we catch are hatchery salmon, and that all sounded very plausible. I’ve never hooked into such a wild and crazy critter, and it makes sense that such a salmon would be wilder and crazier than the hatchery fish. Whatever the case, I was mighty pleased with the fantastic run he made and the bragging rights that he afforded me. Lord knows I try to be humble at times such as this, but it’s awfully hard! I trolled about 40 minutes after Bill and I enjoyed a couple of drinks at The Point. At 1700 I reeled in and cruised downriver to meet my nephew, Darren again, and my lovely niece Ashley, at Brannan Island. They drove over from Stockton to take that crazy salmon off my hands. I hope it tastes as good as it ran – it would be a splendid meal! After they left with the fish, I was happy to climb aboard the coach for one last night at Brannan State Park’s RV facility. It had been a pleasant and successful fishing expedition, and I had a grand time. As usual, I looked forward to my next great Delta fishing adventure! 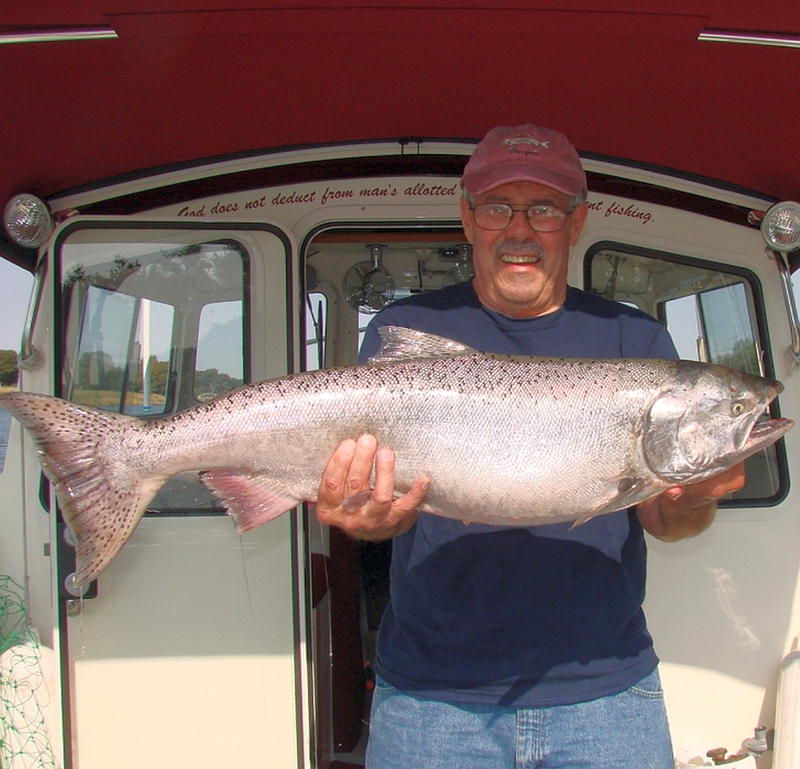 Over the years I have posted many exciting fishing and boating stories here, but now in my seventies, it was time to sell the boat and find less demanding pastimes. All the fishing stories are still here! I will now post my travels aboard the motorhome and other activities. I hope y'all will still enjoy the fishing and boating adventures and perhaps peek in on my post-boating activities on occasion. Thanks for dropping in and I hope you enjoy your visit. This entry was posted in Fishin' with "Sturgeon" John, Fishing Salmon. Bookmark the permalink. 7 Responses to The Salmon are Running the Sacramento River! Well done. thanks for the post. Ron – I don’t get by Collinsville often except cruising down the channel. That must have been some time ago I came by. Thanks for the kind comment. Thanks for the visit,money. I’m glad you enjoyed it. Come back anytime!